The word okonomiyaki is derived from the Japanese words okonomi meaning “as you like” and yaki meaning “grilled” or “cooked”. In short, it’s a savoury pancake filled to the brim with deliciousness (to your liking, of course). When it comes to Okonomiyaki there’s no one distinct style. In fact; each Japanese region will have their own unique way of making it. In saying that; the many variations are often narrowed down to two main styles: the Hiroshima Okonomiyaki (from Hiroshima) or the Osaka-style Okonomiyaki (from Osaka). Both styles includes batter, which is made up of flour and water and/or milk and dashi, shredded cabbage, egg, and green onion alongside your choice(s) of protein, including; bacon, calamari, shrimp or prawn. Hiroshima Style Okonomiyaki differs because the ingredients used are layered rather than mixed into the batter (as is the case with Osaka-style). In addition, “Hiro-yaki” contains fried egg(s) and yakisoba noodles (or sometimes udon noodles) as well! In other words, the Hiroshimians (is that a word?) combine all the best foods into one! Actually, sometimes an Osaka-style okonomiyaki is made with the addition of noodles called Modan-yaki -just to confuse you even more but basically, one’s mixed (Osaka) whilst the other is layered (Hiroshima). The savoury pancake is then topped with a delicious sweet and sour Okonomi sauce, aonori (green seaweed flakes), fish flakes (which smell like fish food – just don’t sniff the bottle like I did) and mayonnaise – yep, it just keeps getting better! Okonomiyaki, often described as Japanese “soul food” is eaten by the locals at okonomiyaki restaurants that specialise in the dish (as opposed to just any old place) where you can sit around a hot iron griddle (teppan) while the food is prepared in front of you or, alternatively, one can sit at a private table equipped with its own hot plate with the luxury (or burden – whichever way you want to look at it) of mixing and cooking the okonomiyaki themselves! 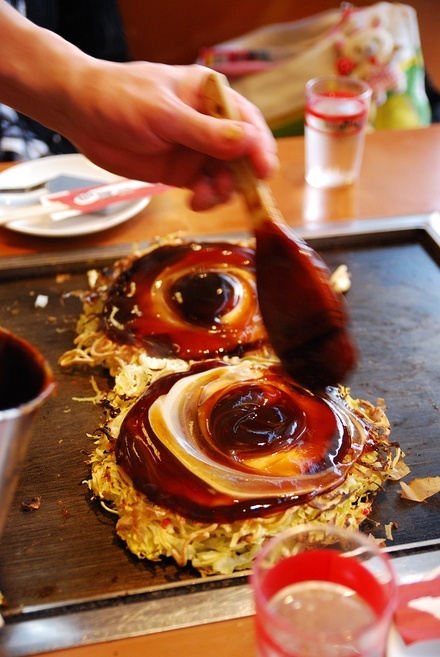 Obviously, this can be a lot of fun and various types of okonomiyaki can be ordered and tried! Nom nom. Also, there’s another style which I believe is worth mentioning here called monjayaki. The batter for this version is much softer than the others and is spread evenly throughout the iron plate and is often eaten when only partially cooked – so, be prepared to have some chopstick trouble! A simple Osaka-style recipe to get ya’ll started on the Okonomiyaki craze! (makes two large pancakes but feel free to half the recipe if flying solo). In a large bowl, whisk together the flour, baking soda, milk, dashi, eggs, salt and pepper. Next add and mix in cabbage and spring onion. Heat some oil in a large frying pan over medium heat then drop the egg mixture into the pan. Top with bacon, prawn and calamari. Cook until bubbles start appearing on the surface then turn over and cook for a further 4-5 minutes or until thoroughly cooked through. To finish, brush the top with okonomi sauce, sprinkle with aonori and bonito flakes and last but definitely not least, MAYONNAISE. Of course, you can make a vegetarian version by omitting the meat – sorry so Captain Obvious, I know.